The Rebel City Los Angeles guide answers the question, what would Los Angeles look like if vertical power as we know it disappeared?. The illustrated two sided guide helps users visualize the city from below, providing details of a developing infrastructure of people-centered institutions supporting human activities outside corporate dominion; from electricity, housing, education, medicine, and banking. Los Angeles born saint Vaginal Davis said “riding on the subway system and buses,,, are the Southland’s true barometer and soul of the city” and the guide hopes to help you take the temperature. Publication lists over 60 sites, and includes essays by Tracy Jeanne Rosenthal and Robby Herbst. Rebel City Los Angeles is a part of the Llano Del Rio Rebel City Project. 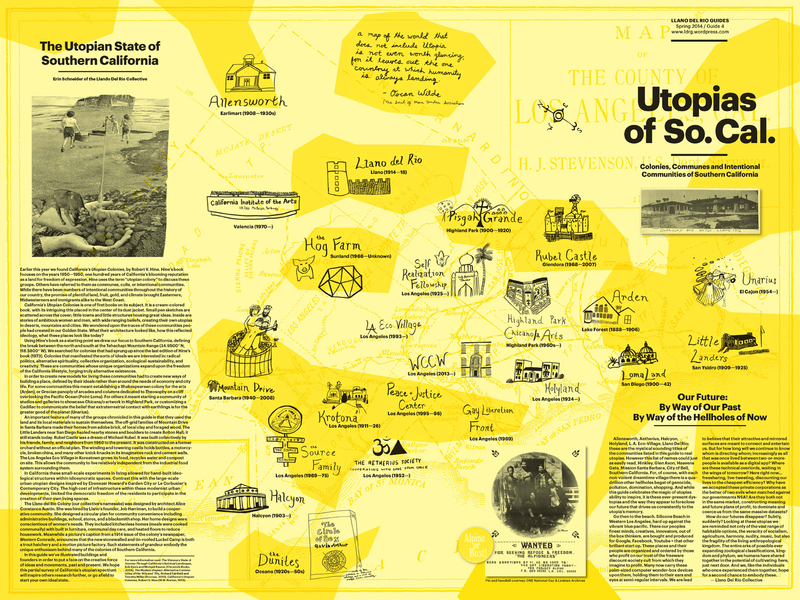 Utopias of So.Cal. contains reflections on the persistence of these colonies in our own utopian consciousness’ written by contemporary artists, filmmakers, and writers; Sandra De La Loza, David Frantz, Janet Sarbanes, Mady Schutzman, Jodie Willie and the Women’s Center For Creative Work (WCCW). This guide, like all Llano Del Rio guides, is free and available to residents of LA county through the mail (send llanodelrio@gmail.com your postal address) or around town (listed below). Non-residents of LA may purchase a copy of the guide online through & Pens Press. Utopias of So.Cal. was organized and written by the Llano Del Rio Collective with Erin Schneider, print design by Content Object. The guide is available for free to all residents of LA County. Guides may be found at designated locations, or may be requested (by county residents) by post by contacting llanodelrio@gmail.com while they last. Anyone can purchase a guide by contacting Half Letter Press. 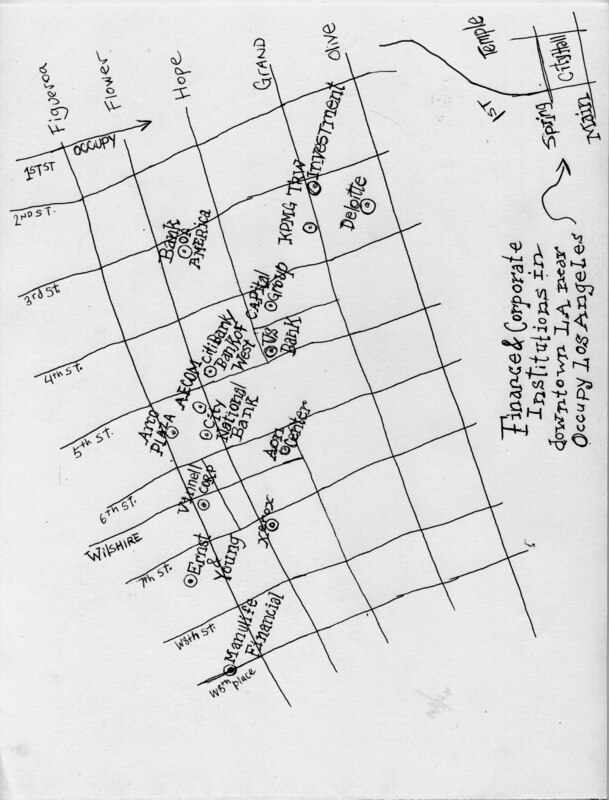 This two sided guide maps locations that have supported creative and radical behavior in LA, including freeway puppet shows, civic dance pageants, riots, and the gatherings of witches. The front of the map is an archive of documents relating to four events. The backside is an exploration of the way non-conformist behavior in LA has helped shape collective imagination . The guide contains contributions by Llano Del Rio, Joel Kyack, Sandra de la Loza, Adam Overton, Nancy Popp, Jonah Schwartz, and Julia Wallace. Design by Kimberly Varella and Department of Graphic Sciences. Scores For The City was funded in part by a grant from the Andy Warhol Foundation. 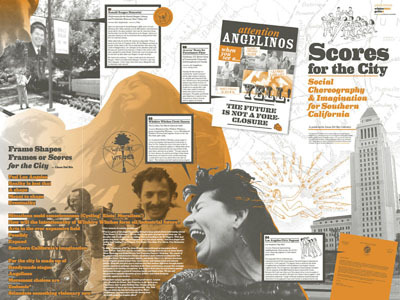 The full-color, two-sided map sites and describes locations that support, dream, act and aid in the creation of an other Los Angeles. Beekeepers, greywater operators, hacker spaces, cooperatives, collectives, art spaces, radical places, gardens, swimming holes, cooking collectives, think tanks etc…. PDF’s of Map (side 1 and 2) available here! Originally distributed for free in Los Angeles County in 2010, and then reprinted in 2014 you can get a copy through Half Letter Press. The Llano Del Rio Collective along with the writer Nolan Boomer is developing an online map resource locating A Peoples Art History of Los Angeles. This project was directly inspired by Nicholas Lampert’s visit to Los Angeles in 2014 where he shared his book A People’s Art History Of The United States.